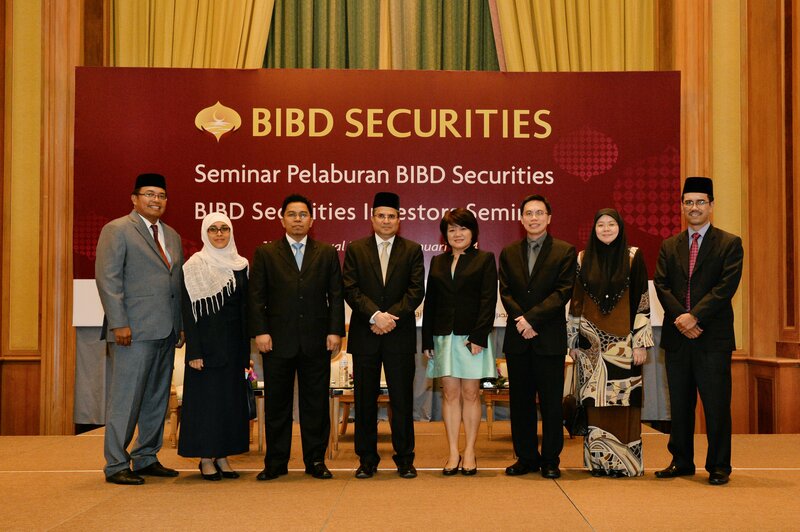 BIBD Securities, a wholly owned subsidiary of BIBD, hosted an Investors Seminar at the Indera Kayangan Hall at the The Empire Hotel & Country Club. At the event was Chairman of BIBD Securities and Managing Director of BIBD, Yang Mulia Javed Ahmad and Managing Director of BIBD Securities and Head of Institutional Banking, Yang Mulia Haji Minorhadi bin Haji Mirhassan. During the welcoming speech by Chairman of BIBD Securities and Managing Director of BIBD, Yang Mulia Javed Ahmad shared how pleased he was to see BIBD Securities pushing to play a more active role in providing investment- based products as a means of wealth creation for the wider public. The Seminar provided investors with global equity market outlook and gold investment, presented by BIBD Securities partners OCBC Securities & Al Rajhi Bank respectively. As part of its strategy, BIBD Securities have entered into a strategic partnership with OCBC Securities Private Limited (OSPL) Singapore. The wholly-owned subsidiary of OCBC Bank is a leading securities broking firm in Singapore providing full brokerage services. Retail and institutional customers can trade globally via their extensive network of connectivity. By leveraging on partnership with OCBC Securities, BIBD Securities intend to utilize OCBC Securities global online trading capabilities to offer Brunei investors direct market access to other markets other than Singapore and Malaysia that it currently offers. With the launch of BIBD Gold Prestige Services, BIBD Securities will be offering physical gold to any interested parties. Representatives from Al Rajhi Bank Malaysia shared with the audience on the gold market outlook as well as the Malaysian experience of physical gold investment. Additionally, as a value- added service, BIBD Securities also provides ease of mind for the customers by ensuring safe custody of their gold along with being protected with Takaful. BIBD Securities Sdn Bhd formerly known as IBB Securities Sdn Bhd was established in January 1994 and is the only entity in Brunei that was issued with Securities Dealer License by AMBD under the Securities Market Order. Apart from BIBD Gold Prestige, BIBD Securities will also be providing its usual array of services which includes the trading of BIBD Shares, Foreign Shares, which provide access to Shariah compliant securities traded at the Singapore (SGX) and Kuala Lumpur (KLSE) and also its BIBD Al-Kauthar Asia-Pacific Fund. This fund offers exposure in the Asia-Pacific region that includes Australia, China, Hong Kong, India, Indonesia, Japan, Malaysia, New Zealand, Philippines, Singapore, South Korea, Taiwan and Thailand. The region represents 24% of the global investable universe, a significant portion of well-diversified, shariah- compliant Investments opportunities. BIBD Securities will also be looking to increase its Shariah Compliant Mutual Funds and product offerings to offer diversification of asset class to meet different risk appetite of our client. This investor seminar will be the first of many that BIBD Securities will be hosting in 2014 with an aim to educate and provide local investors with market updates on different asset class either regionally or globally so that investors can use the information provided to effectively manage their investments portfolio.